Is this an actual seat or only a seat cover? Do you sell actual seats? We do not sell actual seats. We make seat covers. These go over the seat you already have. If your seat still has it's original shape, a seat cover will work for you. Please email us a photo of your seat or text us a picture if you are unsure. Do I just staple the seat cover on? Our seat covers are tailored to fit perfectly and cinch closed on the bottom with military grade shock cord. Here is one of the videos from our Easy Installation Page. Do I just staple the new seat cover on? How does this work? How do I order? The first step is to ensure we make seat covers for your particular scooter model. 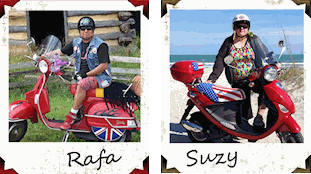 Check our Available Seat Models to see a list with links to the scooters categories. 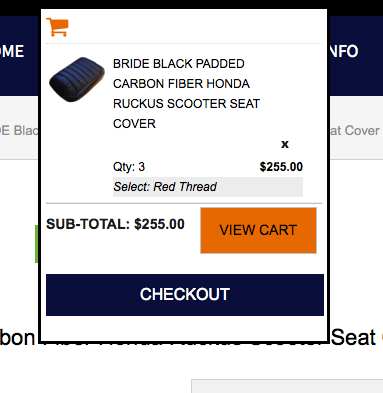 Once you know we have your seat, you can order any kind of seat cover you see on our website for your scooter, even if it is shown on another model . A great place to start is to check out some of our most popular styles in the Top Looks Category. A drop down menu in each Top Looks listing allows you to select your particular model. You can also pick from the Fabric Swatches if you want a different color/texture. Contact us with any questions! Does this include a full seat assembly? Do you sell actual seats? No, we do not sell seats. We only sell seat covers. An actual seat or seat foam are not included. Do I have to remove the old cover? How does the seat cover attach? What tools do I need? Installing a Cheeky Seats cover is very simple. No tools required! You don't have to remove the seat from the scooter, and you do not need to remove the old cover. My seat has a lock or hook, how will I access them? Many seats have a lock built into the seat or a hook that pops out of the front of the seat for carrying a bag. We tailor an opening to allow full access to those features. Our seat covers give you full access to all of the features of your original seat. This photo shows a Vespa LX with openings for the bag hook and lock. How much is shipping? Do you ship internationally? Cheeky Seats offers Free Priority Mail shipping anywhere in the United States. That includes Alaska, Hawaii, Puerto Rico, and all APO/FPO addresses. We ship First Class to Canada for $9.75 and Priority Mail to Canada for $21.95 We ship First Class Worldwide for $18.00 and $29.50. Multiple purchases can increase the international shipping cost slightly, if you are unsure, you can easily check the shopping cart at any time prior to purchase, by clicking the orange "View Cart" button under the total in the pop up window (see below.) The shopping cart icon is at the very top of our website. How do I know which seat cover fits my scooter? Only a seat cover made for your exact model will fit your scooter. Please do NOT buy a seat cover for a model that looks "similar" thinking it will fit. Believe us when we say it will not fit. If you don’t see your model in our categories, check our Available Seat Models page. Once you are certain we make seat covers for your particular model, you can order any seat cover you see on our website, even if it is shown on another scooter model. We will make the seat cover for your precise scooter. How long does it take to get a seat cover? We make all of our seat covers to order, and are usually able to ship within 48 hours. We will always let you know when we are shipping the seat cover. If you have concerns about a deadline, please contact us or include the event date in your order instructions. Most times, you will have your new seat cover the same week that you place the order, in the US. Expedited shipping is available. How do I include special instructions, such as thread or piping color? Or a different fabric choice? Most listings with options have a selector to indicate your choice, but if not, there is a "Notes about your order" box at the end of the order process. If the seat cover you are buying has red piping, and you want black piping, just include that in the notes, and we will verify your selection with you when we receive your order. If you want your seat cover in a completely different color or texture or fabric, please contact us first so we set up the order for you. You will receive a confirmation email from our website, followed by a personal email from us confirming your choice. We will let you know when your order will ship, and when you can expect to receive it. We may have questions about your order. It is VERY important that you include a valid email address (one you will check) as this is the only way we have to communicate with you. Please keep on the lookout for our confirmation email. If you don't receive one in 8 hours, something is wrong, check your spam folder or contact us directly. What scooter models do you make seat covers for? The following is a list of the scooters we currently make seat covers for. If your model is on this list, we can make any seat cover you like for your scooter! If your seat is not on this list, then we most likely cannot make a seat cover for you at this time, but do contact us with the seat you have . We will try to locate one if possible. I don't see my scooter model on your list, is this all you have? Please contact us if you don't see your scooter model listed. We are always adding seats to the line. We do not carry generic Chinese scooter seats. If we do not have your model, you can send us your actual seat and we will hand tailor a seat cover just for you. Contact us for more information. Can I just give you the measurements and have you make the seat cover? No, that will not work. Every seat cover we make is tailored and fitted to an actual seat before it leaves our studio to ensure it fits like a glove. Precise fitting to an actual seat is the way way to achieve the necessary tightness of a proper, safe riding cover. No exceptions. Do you actually make the seat covers? Yes, we personally make all of the items you see on our website. All of our products are made to order in our studio in Montgomery County, Pennsylvania. Nothing is factory made or outsourced. Do you do foam rebuilding, seat reconstruction or seat lowering? No, that's not what we do. We make seat covers. We are tailors, and consider what we do to be crafting garments for your scooter. If your seat cover is torn, ripped, worn out, punctured or disintegrating, then our seat cover is a great solution to cover those flaws and give you a completely new look. If however, you have major chunks of foam missing, or need reconstruction, lowering, or a shape change, that is something best handled by an upholster in person who will need to work directly with your seat. Is there a way to add foam to the seat cover? Yes. We can sew a layer of foam into the top of your seat cover. If your category does not list a cover with the "Padded" option, please contact us for details. Are Cheeky Seats scooter seat covers waterproof? Almost all of our seat covers are waterproof and UV stabilized. The exception would be fleece, faux fur, or cotton covers which are also awesome and machine washable. Waterproof seat covers are clearly marked in the description. What are your seat covers made of? Are they leather? Our seat covers are made of synthetic materials. While we do work in leather, and offer leather accessories, we feel that our premium synthetic materials are superior for seat coverings, because they are waterproof, UV stabilized, and do not require the upkeep or conditioning necessary with maintaining leather. Where can I see more fabric /color options? Want a different color for your seat cover? Click to view our FABRIC SWATCHES. Please note, options shown are for our seat covers, we do NOT sell fabric, sorry! Can I send you fabric to make a seat cover, or order a fabric you don't have? Yes! Many people like to find the perfect fabric for their scooter and send it to us, or have it drop shipped right to us. Please send us a photo of the fabric before you buy it, so we can make sure it will work for your seat cover. Generally we need a yard to yard and a half, but this depends greatly on the scooter seat cover we are making and the size of the actual print or pattern. Contact us for details! How much is shipping and what methods do you use? We ship First Class to Canada for $9.75 and Priority Mail to Canada for $21.95 Mail is delivered by Canadian Post. We ship First Class Worldwide for $18.00 and Priority Mail for $29.50. Should you require expedited shipping this is available upon request. If you have an event date, please email us first to ensure we can meet your in hands date. Rush shipping options available for those in need. 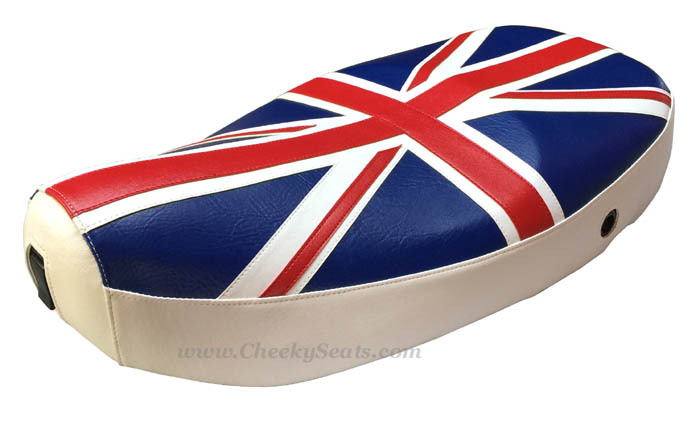 All Cheeky Seats scooter seat covers are insured against loss and damage during shipment at no extra cost to you. We do not process orders on Saturday, Sunday or Holidays. We ship daily Monday through Friday. Yes, Cheeky Seats does accept returns. If you receive an order that is damaged or incorrect, please contact us immediately. All problems must be reported within 48 hours. Please retain all original packaging until USPS claims has been notified. Returns are accepted only with authorization and return number. Custom made scooter seat covers or personalized items are not returnable. We will credit you in the same manner as your original payment within 1 week of receiving the returned item. Each case differentiates upon the given circumstances. We will do everything possible to correct the situation to your satisfaction. Yes, we ship worldwide! We ship First Class to Canada for $9.75 and Priority Mail to Canada for $21.95 We ship First Class Worldwide for $18.00 and $29.50. You will see the option for 1st Class and Priority Mail during checkout, or you can the shopping cart at any time prior to purchase, by clicking the orange "View Cart" button under the total in the pop up window (see below.) The shopping cart icon is at the very top of our website. If you wish to use PayPal for direct checkout, hit the orange View Cart button, and you will see the yellow PayPal button on the actual cart page.